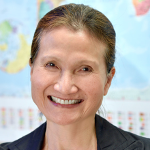 Rosanna Peeling is currently Professor and Chair of Diagnostics Research at the London School of Hygiene and Tropical Medicine (LSHTM) and Director of the International Diagnostics Centre (IDC). Trained as a medical microbiologist, Dr. Peeling had been Research Coordinator and Head of Diagnostics Research at the UNICEF/UNDP/World Bank/WHO Special Programme on Research and Training in Tropical Diseases (WHO/TDR) in Geneva, Switzerland, and the Chief of the Canadian National Laboratory for Sexually Transmitted Diseases before assuming her current position. Her work in WHO/TDR focused on the evaluation of diagnostics appropriate for developing countries settings, to inform policy and procurement decisions. Dr Peeling’s work at LSHTM spans from facilitating test development and evaluation to translation of evidence to policy, appropriate placement of new diagnostic technologies into different health care settings to ensure maximum impact, and innovation in the uptake of testing by marginalised populations. She established the IDC to provide a global hub for advocating the value of diagnostics, fostering innovation, and accelerating regulatory approval and access to quality-assured diagnostics to improve global health. In 2014, she was awarded the George MacDonald Medal by the Royal Society of Hygiene and Tropical Medicine for contributions to tropical medicine, becoming the first woman to receive this honour.